Another player picked up at the trade deadline, not because of a trade however. Instead he was picked up off of waivers. Marco Sturm was brought in to bolster the offense for the playoffs. Sturm definitely added some punch, but his numbers were low. He was apart of the Joe Thornton trade which sent the all-star forward to San Jose from Boston. Boston traded him to LA and he missed most of the season recovering from a lower body injury. In the 18 games he played in for the Capitals he only mustered one goal and had seven assists. Meager numbers for some one that had some good scoring chances in just about every game he played in. The Caps were hoping he was just a little rusty from his recovery off ice. But his lack of offensive production seemed to carry over into the playoffs. He had only one goal and two assists in the post season. 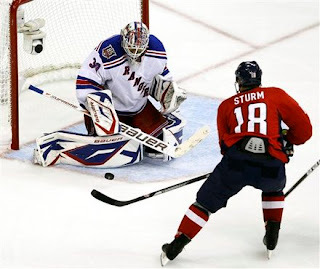 Sturm added another aspect to the Caps' offensive punch, but if he doesn't score what good could he really be. He has experience and is a solid forward. He was also excited to play with this team when he heard the Caps took him off the waiver wire. His price tag is moderate at $3.5 million and with a full off season could come back healthier than ever and ready to make a bigger splash in Caps' red. Sturm's speed and hands are an asset. Even though his price tag is not much, it is far to high for an offensive player only averaging one goal every 13.5 games. His injury can also be a problem down the road and staying healthy through a full season will be helpful. Since he was brought on board as a rental, it is unlikely McPhee will resign him in the off season. Marco's work ethic in PO was one of the best!!! Smart and hard working player. If only he could put more pucks in the net I would definately like to see him for another season! !